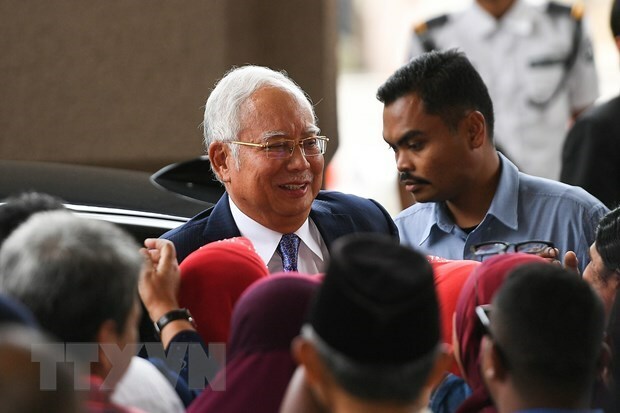 Hanoi (VNA) – After several delays, Malaysia finally opened the trial on April 3 for former Prime Minister Najib Razak, who faces corruption charges relevant to the scandal at the state investment fund 1Malaysia Development Berhad (1MDB). At the trial, Razak faces seven charges, including corruption, criminal breach of trust, and money laundering, which were said to have helped him pocket 42 million MYR (10.3 million USD). He denied all charges brought against him. The former PM was initially due to stand trial on February 12, but the trial was delayed as proposed by his defence team. The trial took place nearly one year after Razak lost in the general election that helped former PM Mahathir Mohamad, 93, to return to power. The 1MDB scandal was one of the reasons why Malaysian voters turned their backs on Razak’s coalition in the election in May 2018, ending the six-decade rule of this coalition, and raised support for Mohamad’s alliance. Since this election, Razak has faced 48 charges, mostly related to the 1MDB fund and other state institutions. However, he denied any wrongdoings. Najib founded the 1MDB investment fund in 2009, supposedly to serve Malaysia’s development through global partnerships and foreign direct investment.